Near the top of an impossibly steep and winding street above Allessandro, there sits a quietly fading house, its cracked gray shingles and worn brown siding dappled by the shadows of hovering trees. Trash bins lean against one other as if napping, a chicken-coop fence strains to hold up eroding soil; and on the dusty mailbox that tilts hesitantly towards the road, a few pale letters can be made out: Landacre.Passing by so discreet a spot, one might never guess that he is witnessing a cultural landmark of particular significance to our neighborhood. It was once the home of one of Echo Park’s many notable artists: the groundbreaking printmaker, Paul Landacre. The Landacres lived in the El Moran house for the remainder of their lives, and Paul, a noted naturalist, spent much time in the secluded spot gardening and befriending local wildlife. He famously rehabilitated a wounded petrel, and the two became so attached that the bird would sit on his shoulder while he read the newspaper on the house’s front porch. 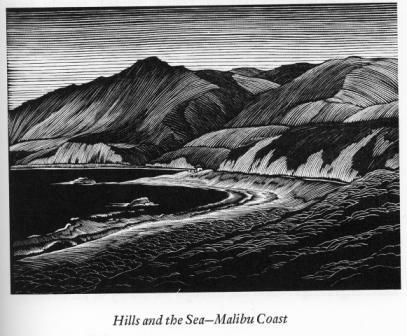 He later adopted the petrel as his monogram (perhaps his affinity for the bird was related to his own handicap, for Landacre, a former champion at track and field, had become disabled by a streptococcus infection while in college).Many of his engravings were in fact inspired by the landscape around the El Moran property, and virtually all of the works that he created during his and Margaret’s time there were made on his own hand press: a fact which some have credited as a turning point in his career, for it enabled him to constantly check the progress of his work, as well as personally select with which paper and ink they would be printed. This section of the neighborhood once was known as the Semi-tropics Spiritualist tract, and the Landacre home was declared a City of Los Angeles landmark (Historic Cultural Monument No. 839) in March 2006. Paul Hambleton Landacre (1893-1963) and his wife Margaret moved to 2006 El Moran in March of 1932, having acquired the deed for the Depression-era price of two thousand dollars. 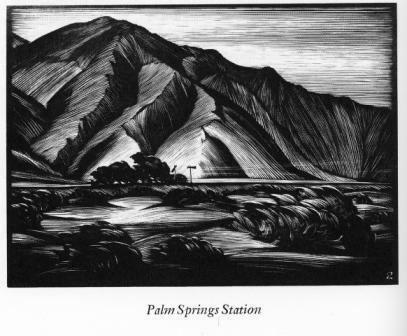 They moved to El Moran shortly after the artist published a book of his works, titled “California Hills.” At the time, Landacre had already begun working exclusively in the art of printmaking with wood engravings, having studied at the Otis College of Art and Design (he would later teach there). Paul Landacre passed away in 1963, due to complications in the aftermath of a suicide attempt made soon after Margaret died. 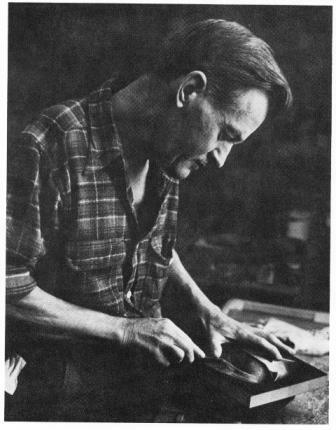 His work is considered by many to be the standard by which engraved wood printmaking is judged. For more information, the biography “Paul Landacre: a Life and a Legacy” is available at Dawson’s Bookstore.